Today it is time to celebrate! Today the Center for Medicare and Medicaid Services (CMS) announced that it is taking a tremendous step to improve the care of Medicare beneficiaries and ensure that patients receive care that matches their goals and values. 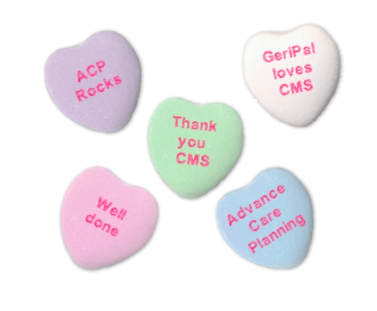 CMS proposing to begin payment for advance care planning!!! The advance care planning codes appear in the American Medical Association’s Current Procedural Terminology (CPT) manual as 99497 and 99498. These consultations are voluntary on the part of the patient and the patient’s preferences are key to the process. Look for more details about how to implement these codes soon. The CMS proposed rule for physician payment can be found here. CMS states "For CY 2016, we are proposing to assign CPT codes 99497 and 99498 PFS status indicator "A," which is defined as: "Active code. These codes are separately payable under the PFS. There will be RVUs for codes with this status." The presence of an "A" indicator does not mean that Medicare has made a national coverage determination regarding the service. ...We are proposing to adopt the RUC-recommended values (work RVUs, time, and direct PE inputs) for CPT codes 99497 and 99498 beginning in CY 2016 and will consider all public comments that we receive on this proposal.. "
Regular readers of GeriPal know the value of advance care planning (ACP). ACP leads to better care, higher patient and family satisfaction and it lowers caregiver distress. The Institute of Medicine (IOM) report, Dying In America, sends a clear message to policy makers by highlighting clinician-patient communication and advance care planning as one of the key areas of focus and recommendations. The IOM report recommends that standards for clinician-patient communication and advance care planning be developed that are measurable, actionable, and evidence-based. The report states that "payers and health care delivery organizations should adopt these standard and their supporting processes, and integrate them into assessments, care plans and the reporting of health care quality"
The journal JAMA Internal Medicine recently published an excellent article from the American College of Physicians High Value Care Task Force, Communication about Serious Illness Care Goals: A Review and Synthesis of Best Practices. Drs. Bernacki and Block report that communication about serious illness care preferences improved clinical outcomes without increasing anxiety, depression, or loss of hope, but did reduce surrogate distress. The practical guidance for clinicians section is a MUST READ. Rebecca Sudore and her team's Prepare for your care (see the GeriPal discussion here) and Ellen Goodman's Conversation project are two excellent resources that empower patients and families to start the difficult conversations about serious illness that you should be promoting to patients, families and clinicians. VitalTalk is a great place where clinicians can develop the skills of challenging conversations. Check out the VitalTalk clinicians section where you can view quick guides on key skills and then try the Watch, Read, Reflect sub-section to improve your skills. Advance care planning should be considered the standard of care for excellent communication and delivering patient-centered care. So, on behalf of GeriPal, and geriatricians and palliative care providers everywhere, let me just say a GIANT THANK YOU to CMS for taking this important step towards recognizing the value of physicians communicating with patients and learning patient preferences. Thank you! Note: For more info, see the post on Pallimed by Phil Rodgers on this same subject, with a different focus. Comments can be submitted online at regulations.gov.